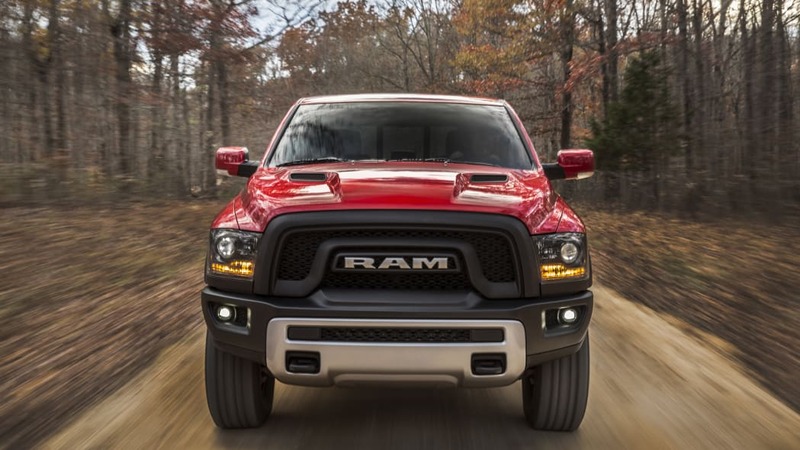 Emboldened by record sale and increasing market share, Ram continues to spin off derivatives of its fullsize pickup. 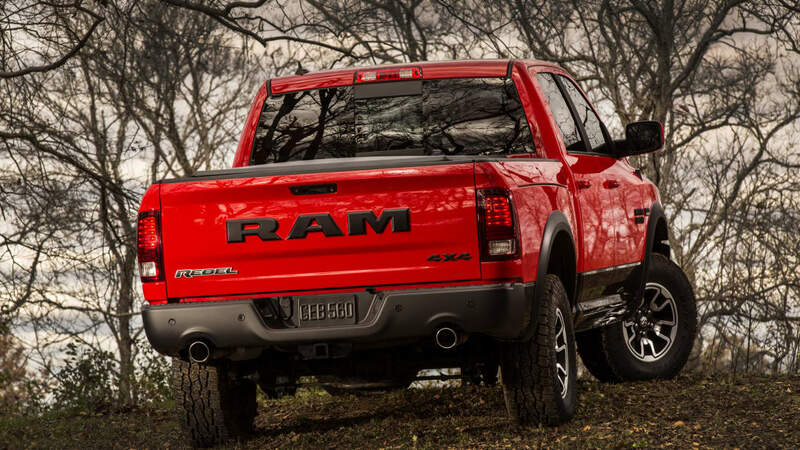 Bowing at today's Detroit Auto Show, the 10th model based on Ram's 1500 series is the new-for-2015 Rebel, and it's designed to capture the affections of that exceedingly popular marketer's bogey, the "active lifestyle enthusiast." 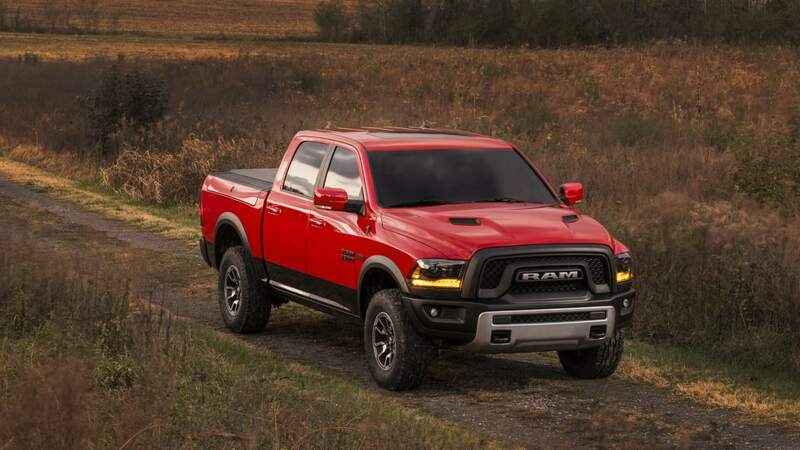 Ram officials figure they've already got the hunt/fish/camp crowd all sewn up with the 1500 Outdoorsman, so the Rebel's imposing snout strikes out in a different direction in search of extreme-sports types – namely customers with dirt bikes, side-by-sides, jet-skis and other powersports toys. 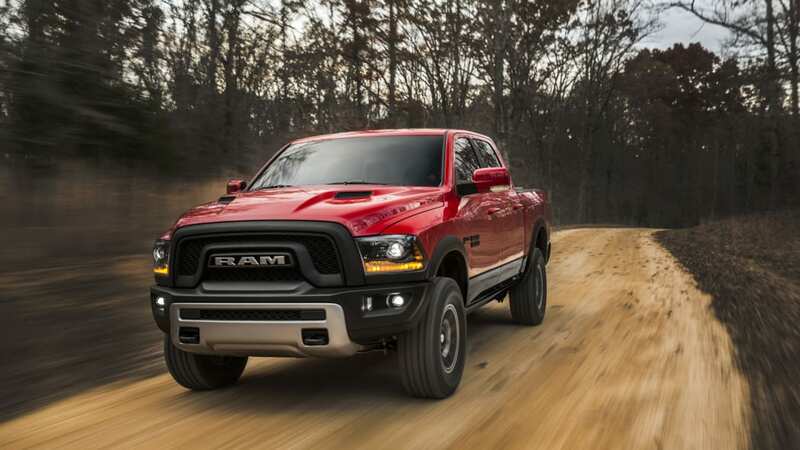 If that has you envisioning the Rebel as a rival to the Ford F-150 SVT Raptor, think again – "It's not an extreme, desert-racer off-road type product," says Ram boss Bob Hegbloom. 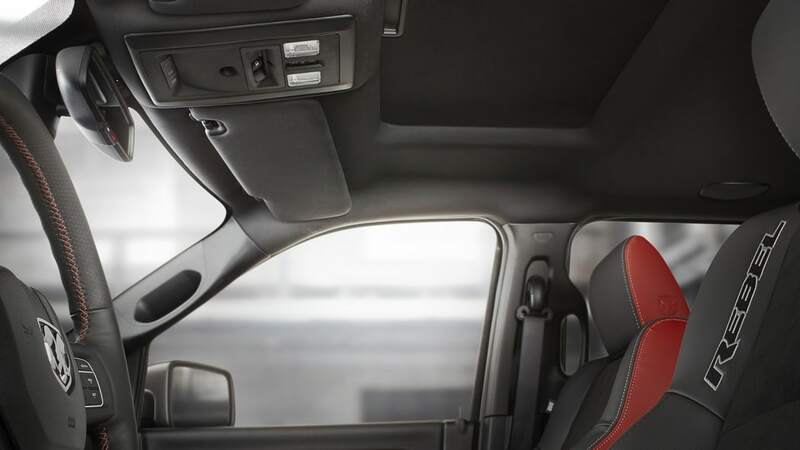 If you're seeking an analog from another automaker, look to the Toyota Tundra TRD Pro and we think you'll be in the ballpark. 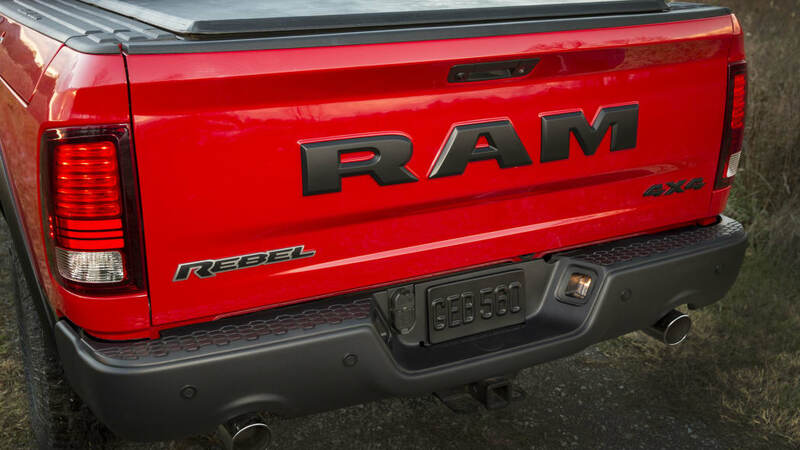 The Rebel's most distinctive styling element has to be its radical new grain-finish grille, which does away with Ram's longstanding crosshair motif in favor of an interlocking design that intentionally won't be for everyone. 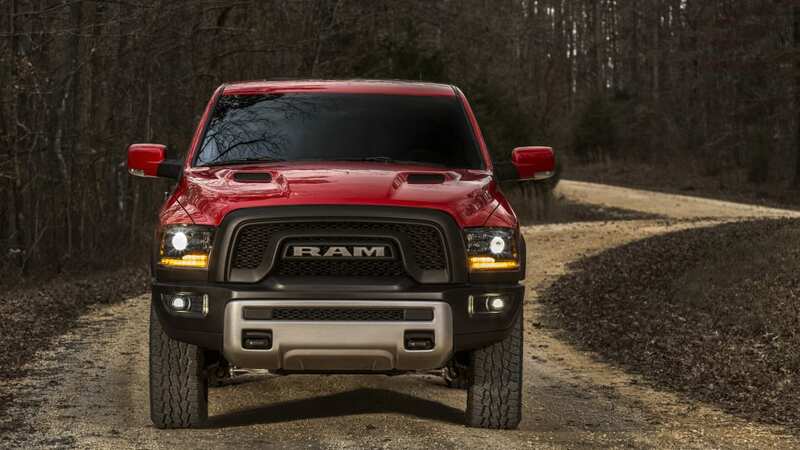 There are lighting changes, too, with black-bucket headlamps featuring LED accents and matching LED foglights. 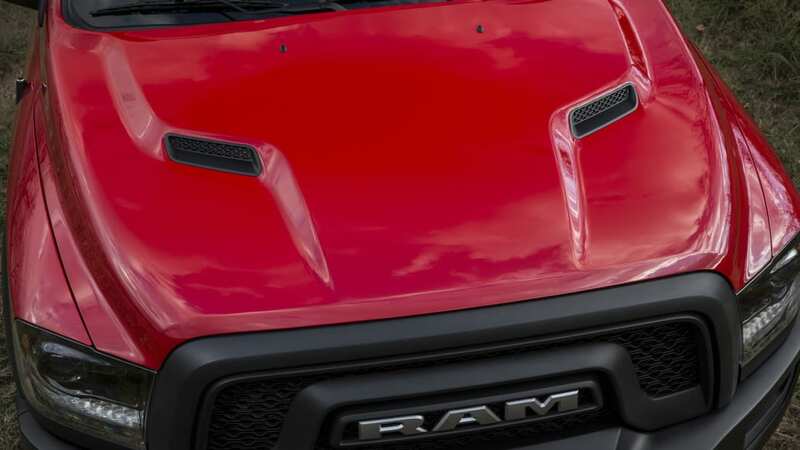 A non-functional twin-snorkel sport hood, tonneau cover with stamped logo, blacked-out taillamps and unique badges are other model telltales. 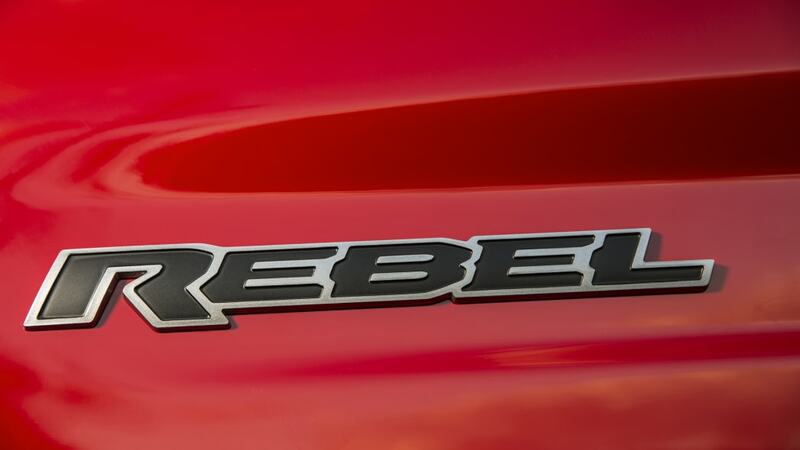 The Rebel (where have we heard that name before?) 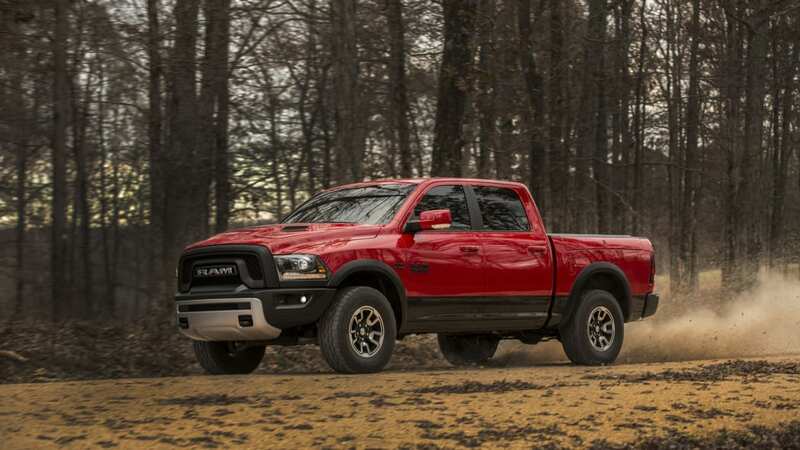 makes good use of Ram's air suspension system as an easy way to raise the ride height by an inch, which in turn affords inch-longer suspension travel and lends the truck a more formidable stance while helping clear the 33-inch (LT285/70R17E) Toyo Open Country A/T tires. 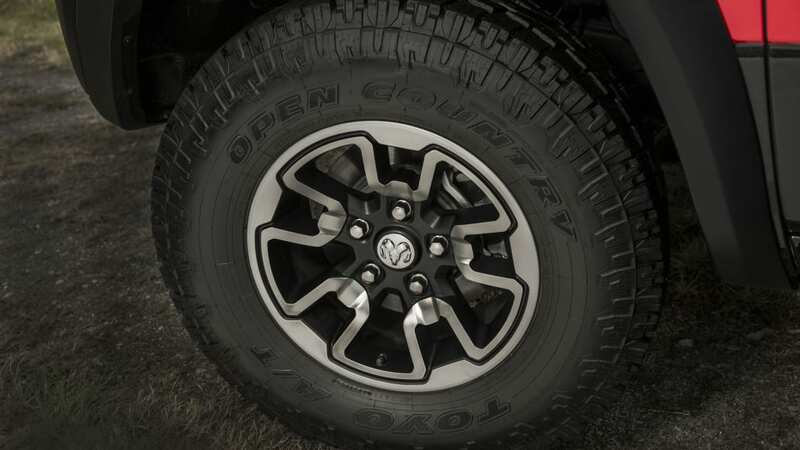 Flares swiped from the 2500 Power Wagon keep the wider rubber mounted on Rebel-exclusive 17-inch wheels nicely – and legally – tucked in. 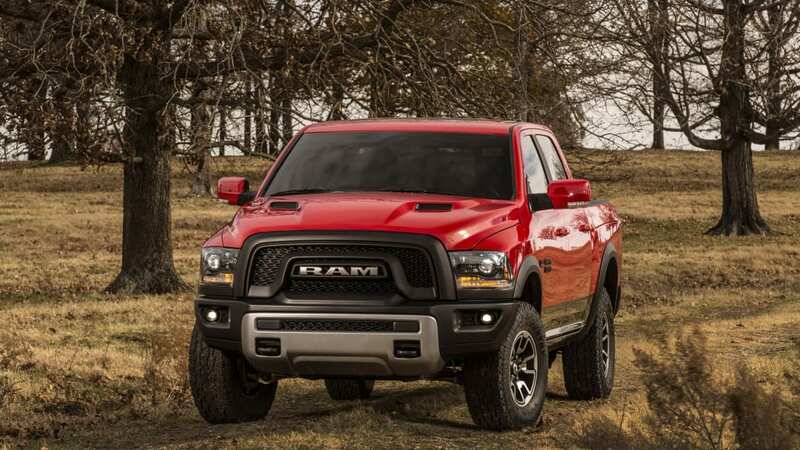 Further off-road-minded modifications include a close-cropped steel front bumper that offers an improved arrival angle as well as 360-degree tow hooks and replaceable center skid plate. 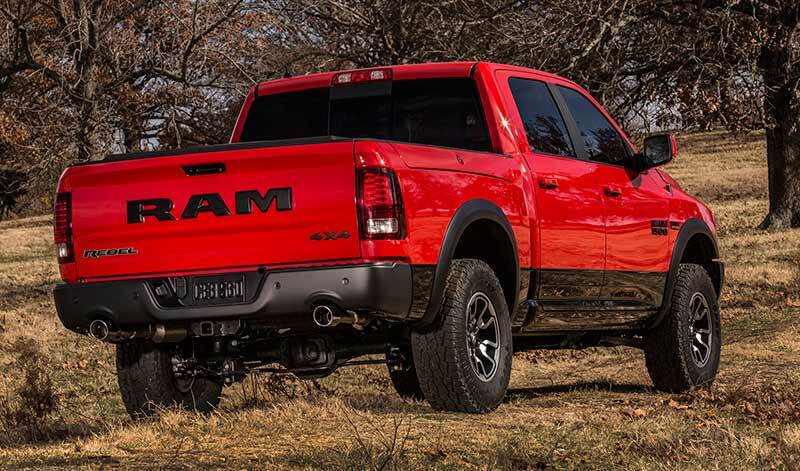 Out back, dual exhausts tuck up into the bumper and out of harm's way, but you might be too busy staring at the billboard-sized RAM tailgate lettering to notice. 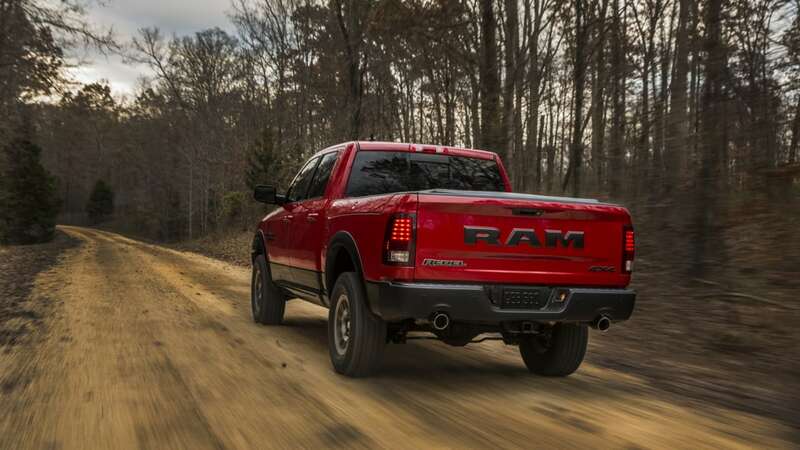 Ram officials assure us the Rebel's suspension has been recalibrated to cope with the higher ride height and better off-road ability (mostly through the inclusion of Bilstein monotube shocks, a softer rear anti-roll bar and reworked jounce bumpers). 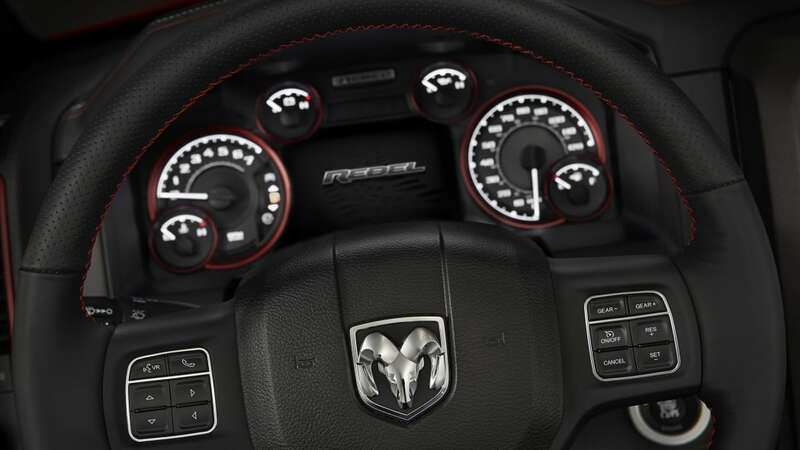 Steering and stability control calibrations have also been altered. 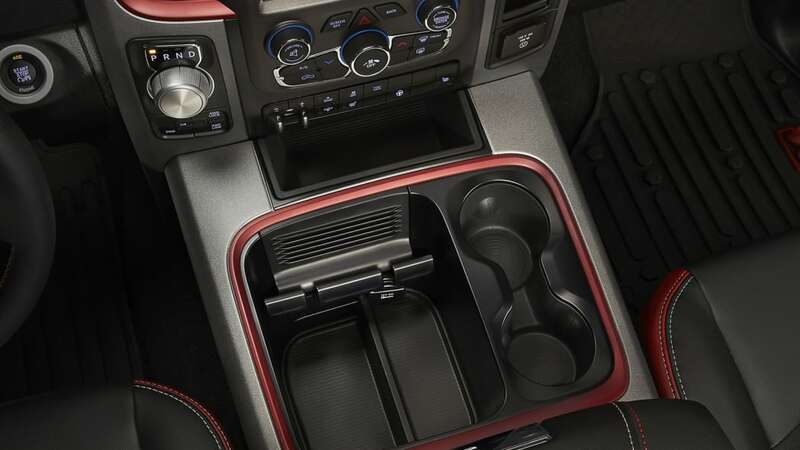 Interior changes are fairly comprehensive, as well. 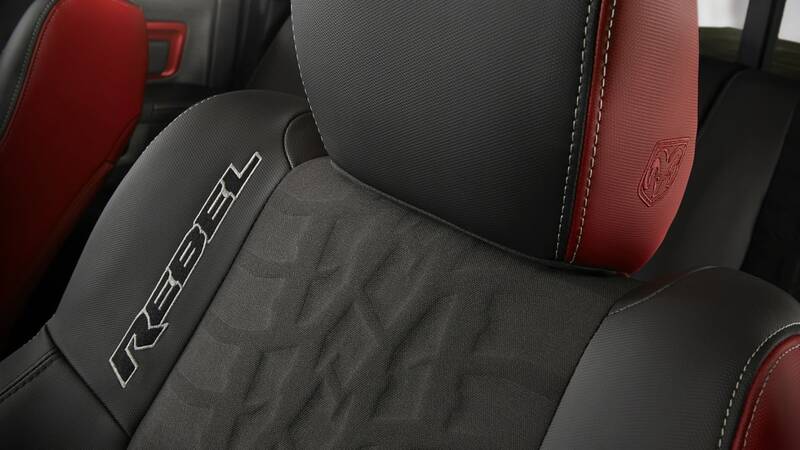 Radar Red seatbacks and sides are faced by vinyl surfaces displaying a unique embossed tread-pattern motif (mimicking the aforementioned Toyo rubber), along with the predictable appearance of contrast stitching and badging. 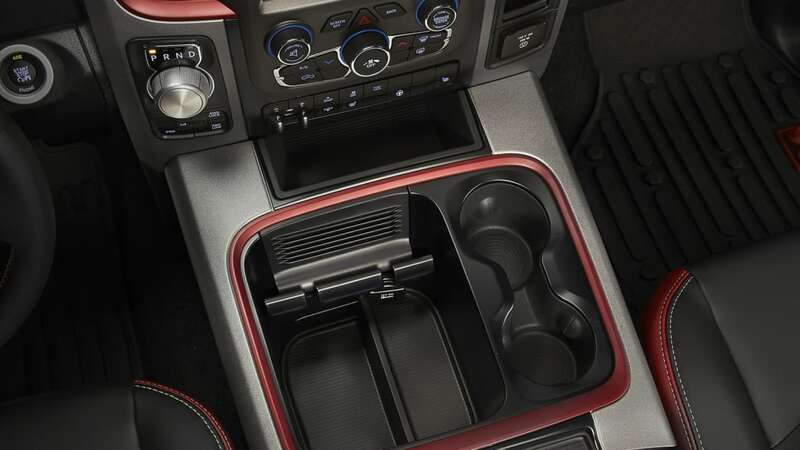 Matching red anodized dash trim, unique gauge faces and beefy all-weather floor mats with removable carpets are among the other Rebel-spec touches. 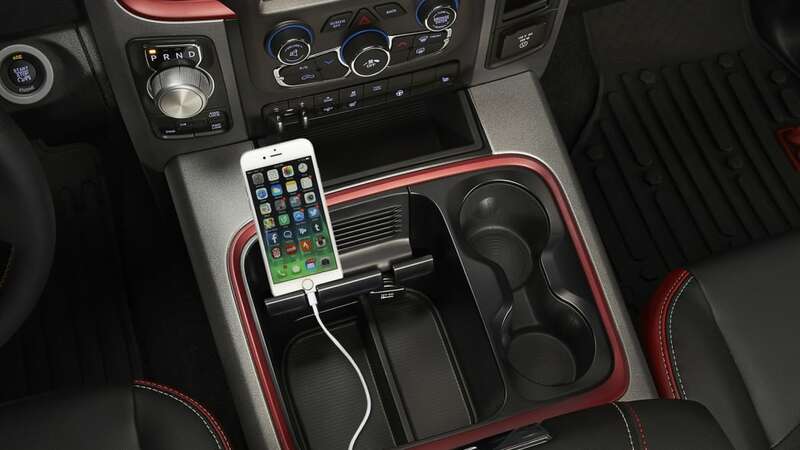 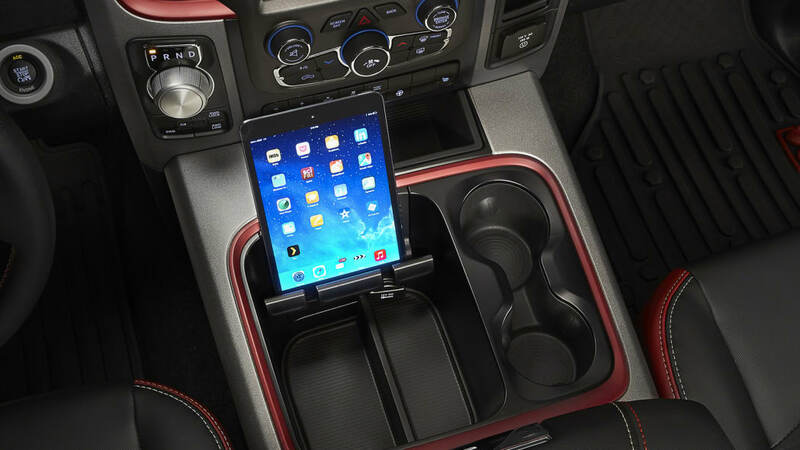 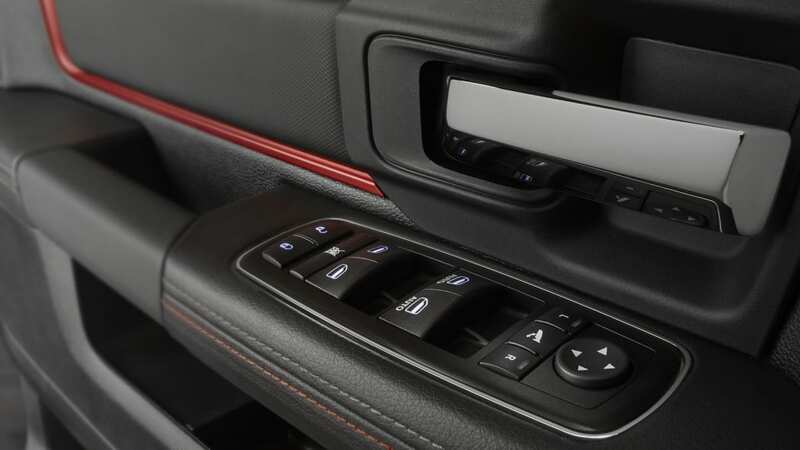 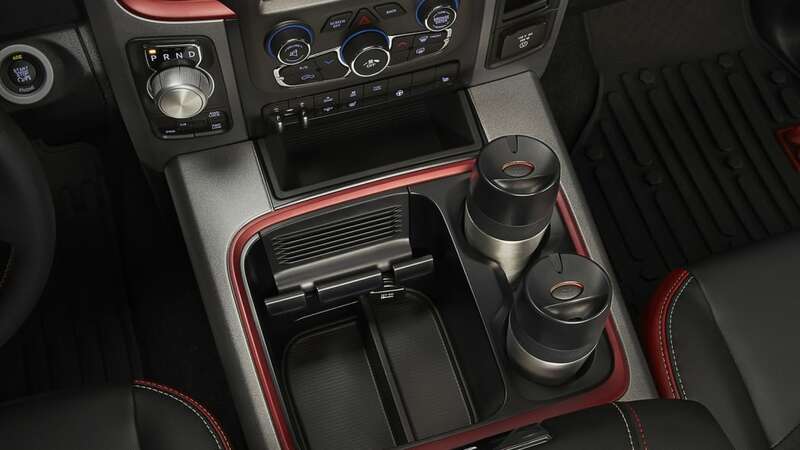 Finally, there's a revised center console with improved cupholders and an angled prop for smartphones and tablets, a design we expect will spread to other Ram 1500s in short order. 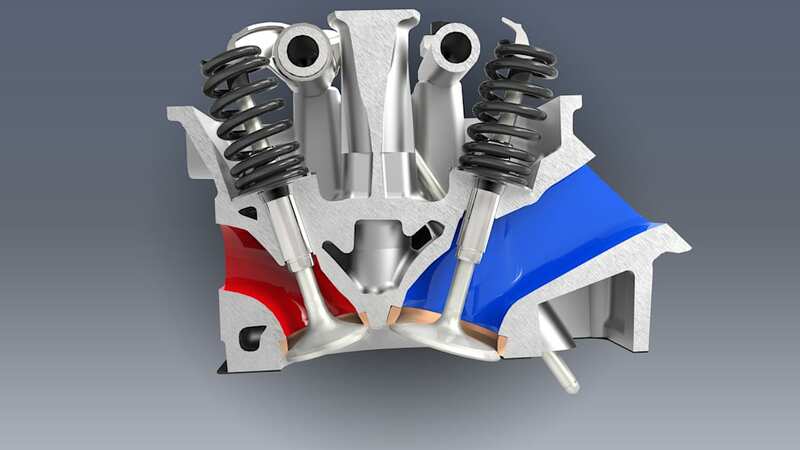 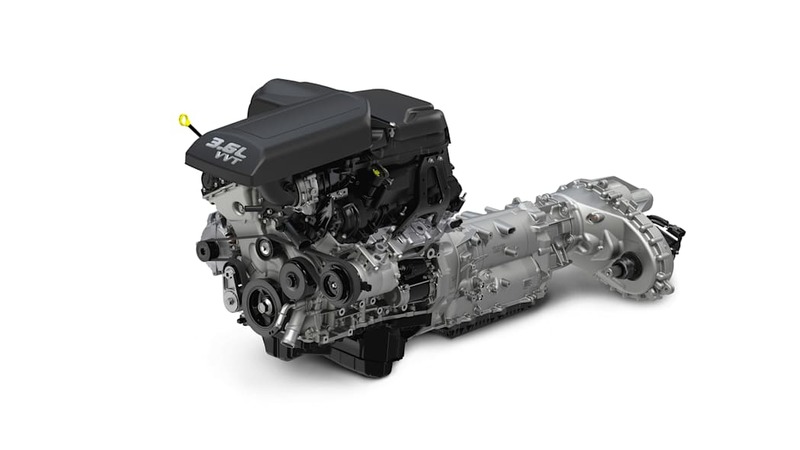 Both 3.6-liter Pentastar V6 and the 5.7-liter Hemi V8 engines will be offered with either a 3.55 or 3.92 rear end (the latter being a first-time application for the six cylinder), but beyond that, there aren't many noteworthy driveline changes under the skin. 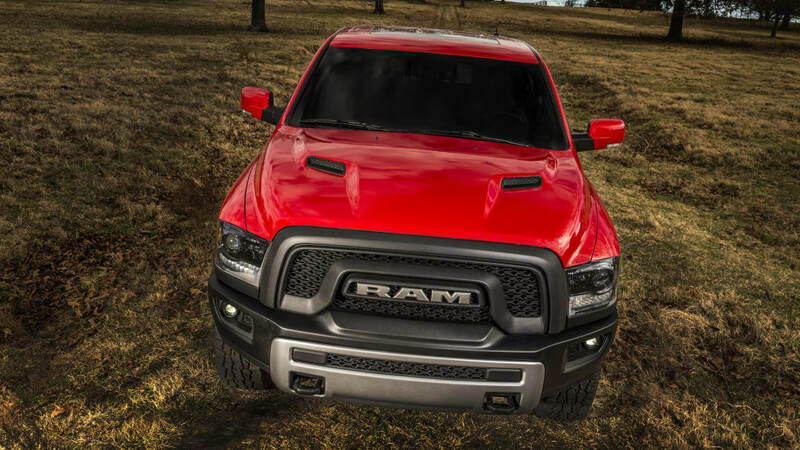 Ram's impressive 3.0-liter EcoDiesel will not be available. 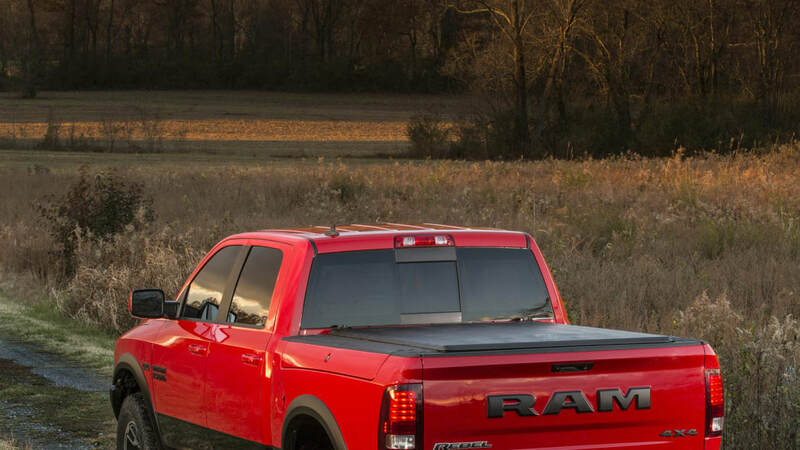 Available exclusively in crew cab configuration with a five-foot, seven-inch bed, the Rebel will be orderable in both 4x2 and 4x4 spec. 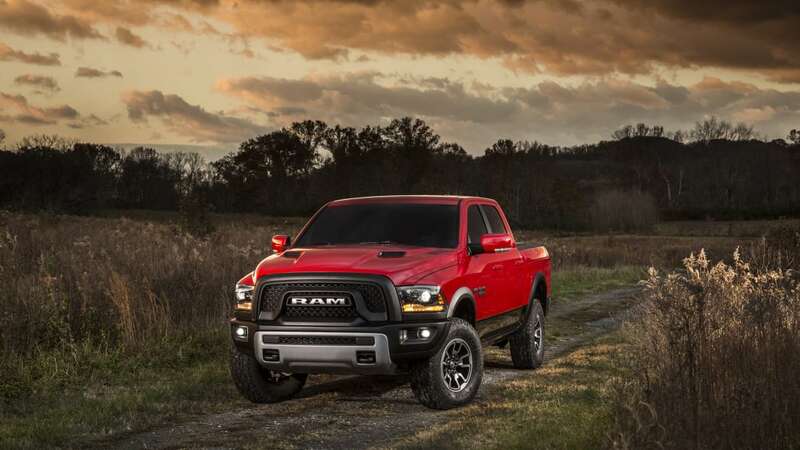 Pricing has yet to be released, but the model is built off a mid-level trim, so bet on an MSRP somewhere north of the $31,940 Big Horn model when it comes to market in the second quarter of this year. 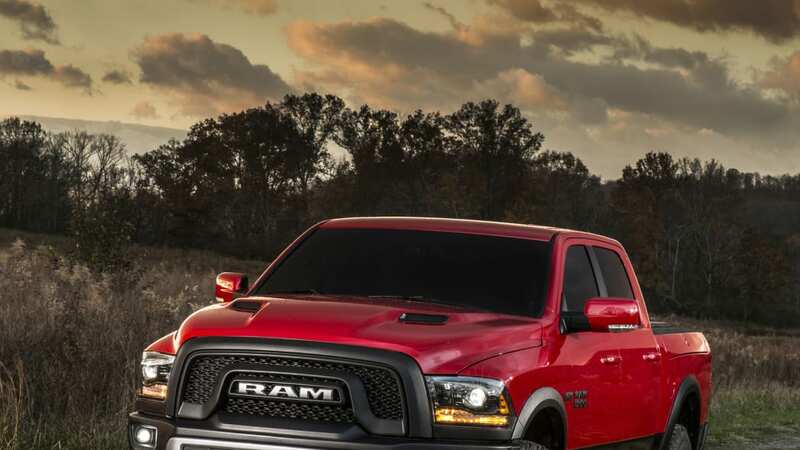 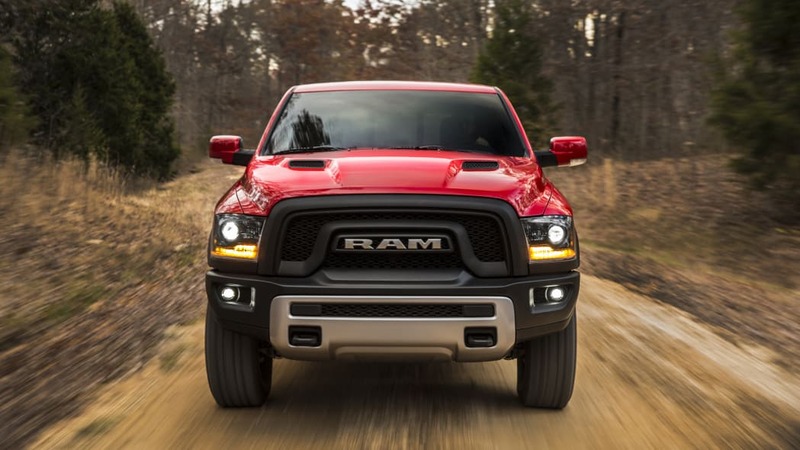 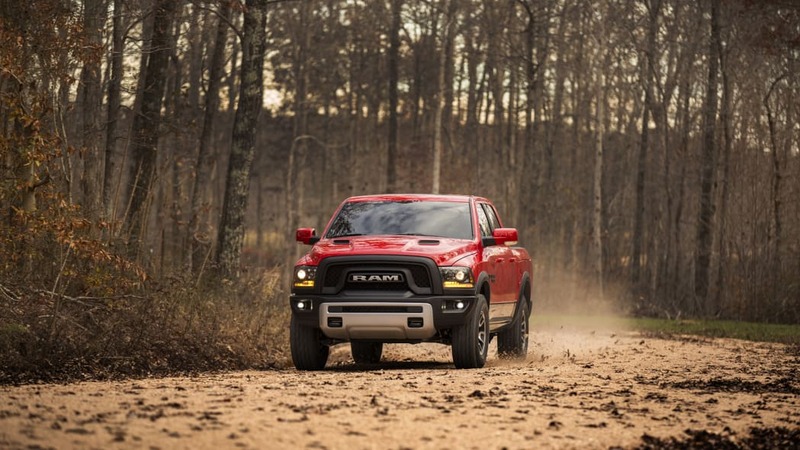 January 13, 2015, Auburn Hills, Mich.
"Offering an off-road-style package on the Ram 1500 has been on our to-do list for some time but the right combination didn't present itself until now," said Bob Hegbloom, President and CEO - Ram Truck Brand, FCA US LLC. 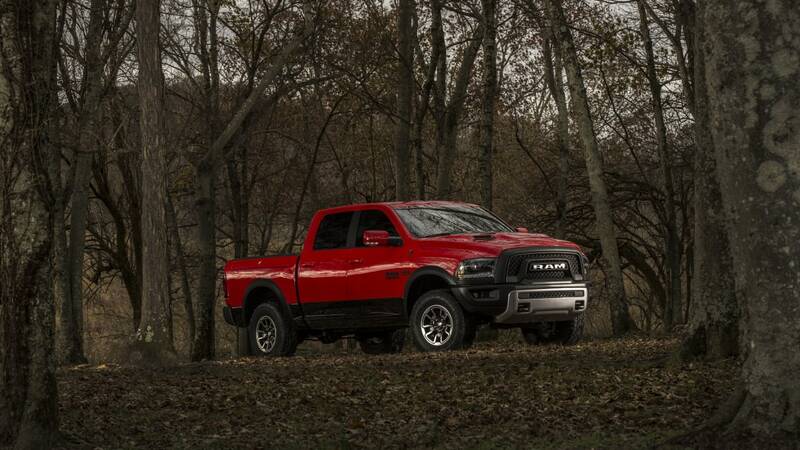 "The Rebel drops right into a core segment of the truck market with unique design cues and can-do attitude backed by Ram Truck engineering." 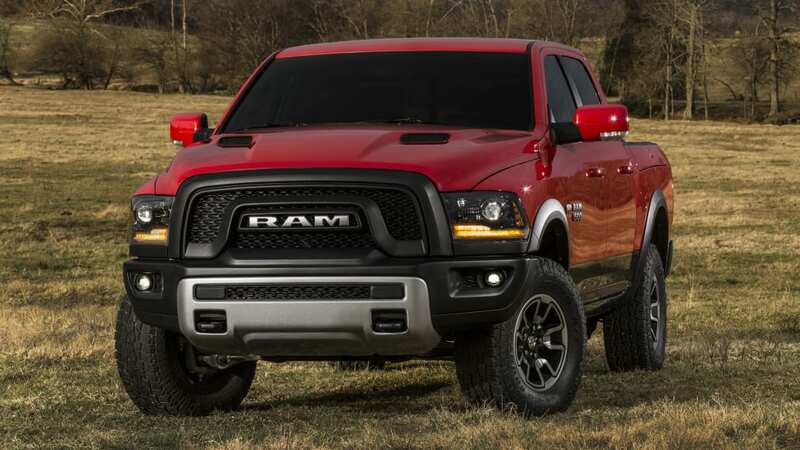 Rebel features an all-new grille with prominent billet silver "RAM" letter badge. 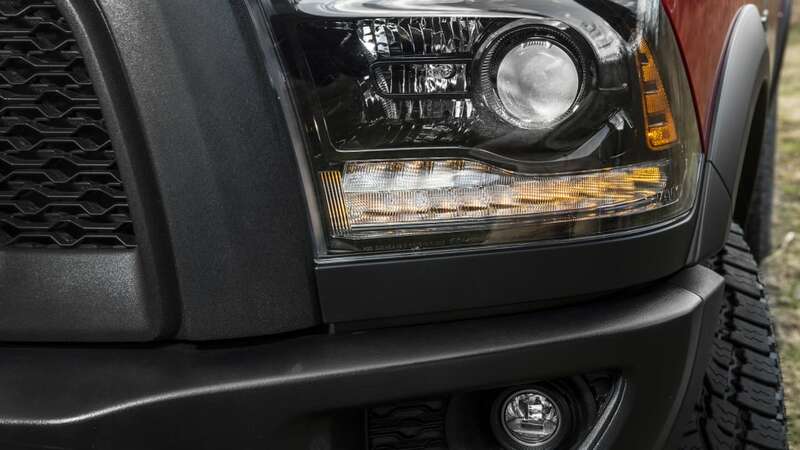 Departing from the brand's iconic "cross-hair" designs, the blacked-out Rebel grille tops a completely new black off-road front bumper design with a durable powder-coated surface, which incorporates a powder coated, billet silver skid plate, new front tow hooks and new LED fog lamps. 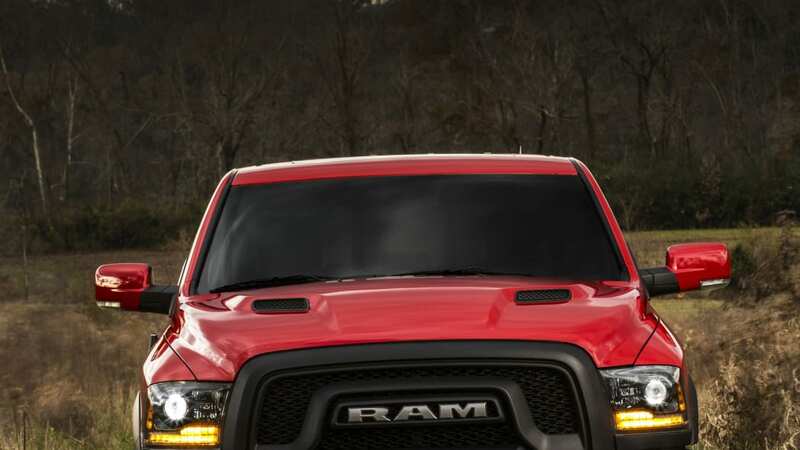 Black bezel bi-functional projector headlamps with LED marker lights lie beneath an aluminum, twin-snorkel sport hood. 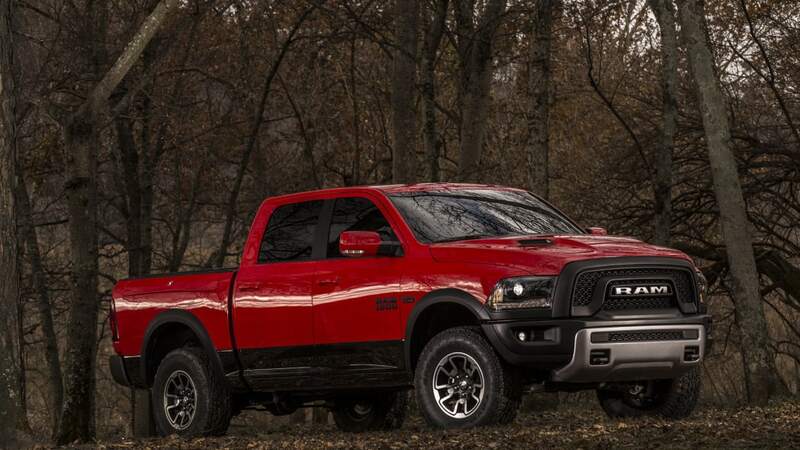 Rebel's blacked-out front-end continues on the flanks, where black Power Wagon wheel-arch moldings, flat-black badge, mirrors and lower body panels create a distinctive trail-ready presence. 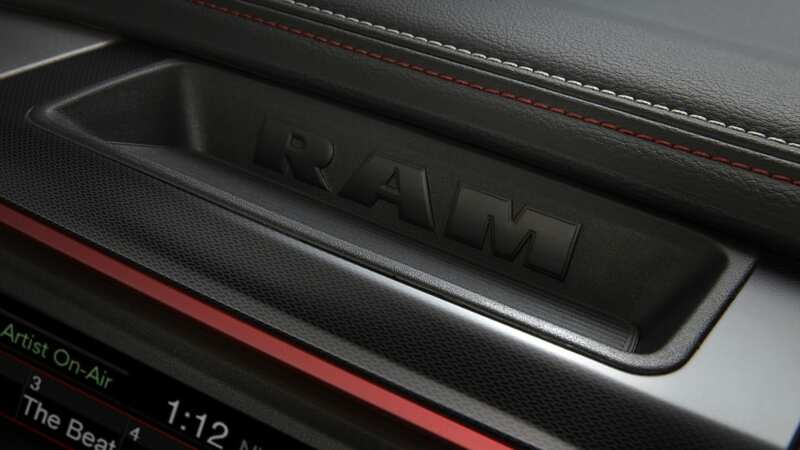 The new trim features a two-tone paint scheme with black as a constant on the lower body, front to rear. 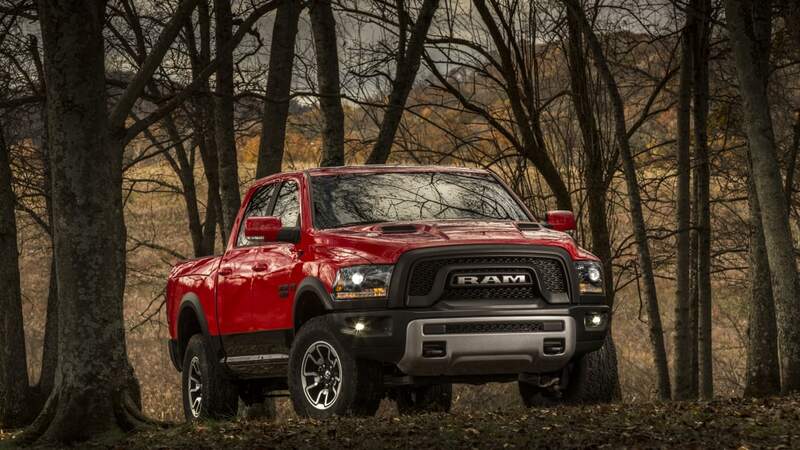 The Ram 1500 Rebel features an all-new 17-inch aluminum wheel. 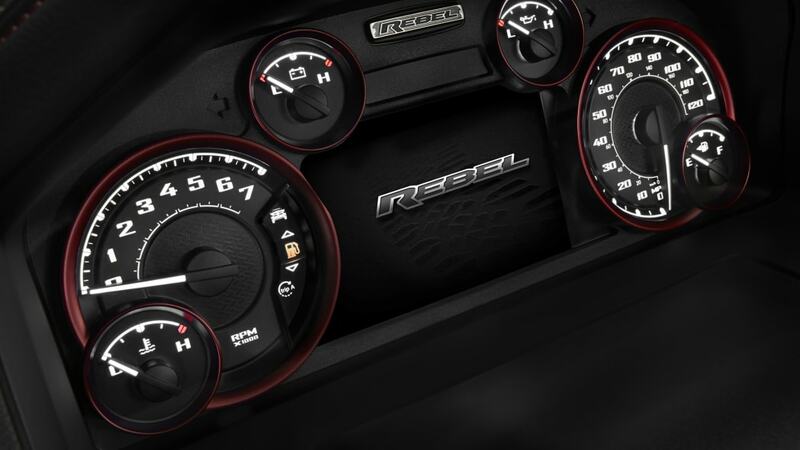 Among the most elaborate designs found in mass production, the new one-piece wheel incorporates matte black painted accent pockets and multi-angled surfaces linked to the Rebel's off-road bias. 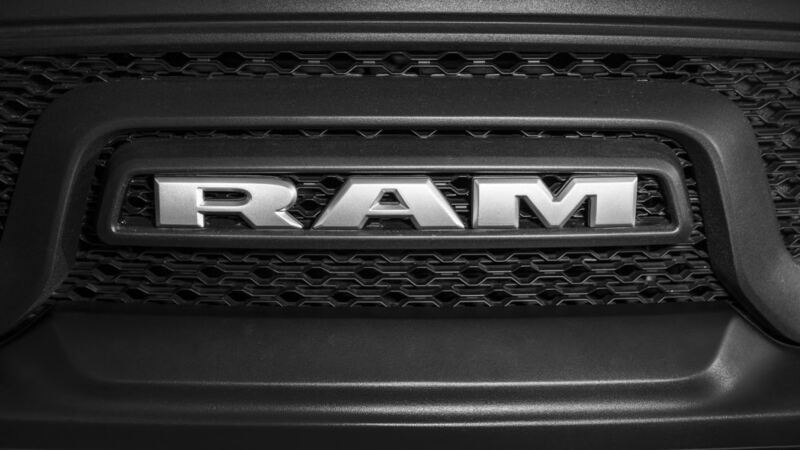 Continuing around to the rearview is a bold new "RAM" stamped tailgate with blacked-out lettering. 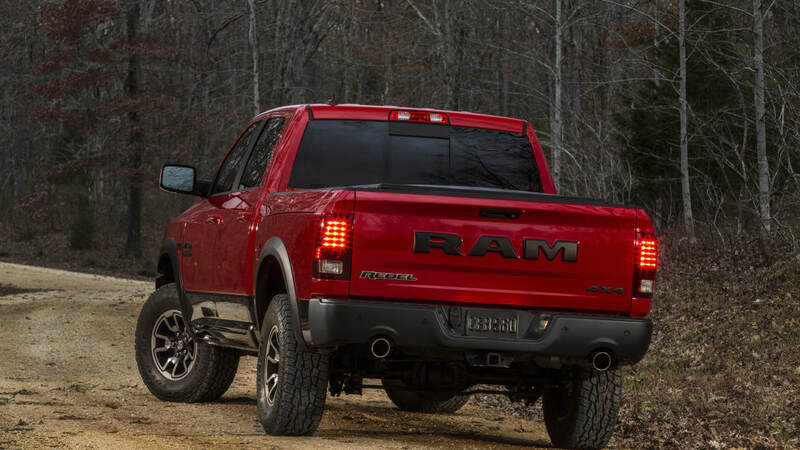 The "Rebel" and "4X4" badge emphasize the truck's uniqueness. 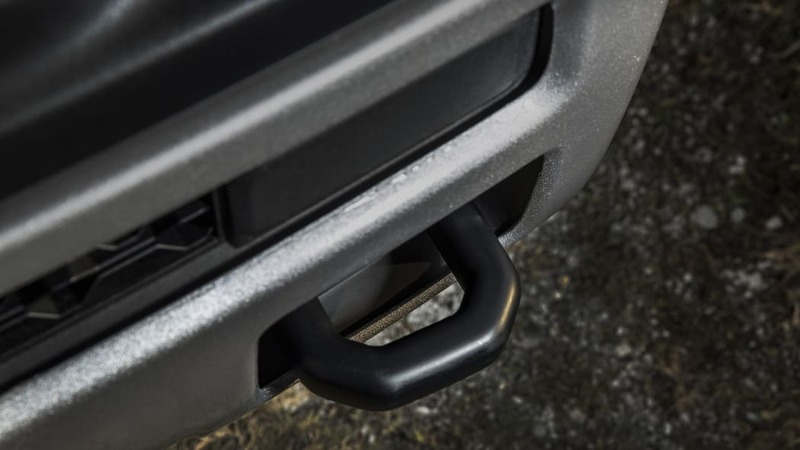 The rear bumper is also treated with durable black powder coating with flared cutouts around dual chrome-tipped exhausts. 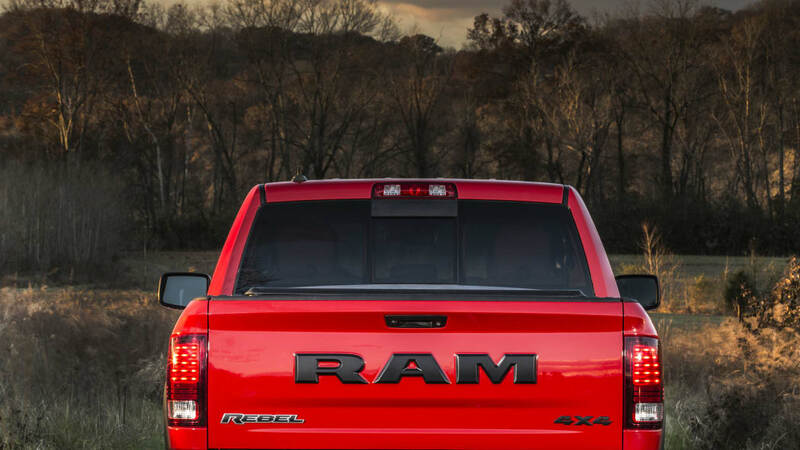 Tail lamps incorporate black bezels to match forward lighting. 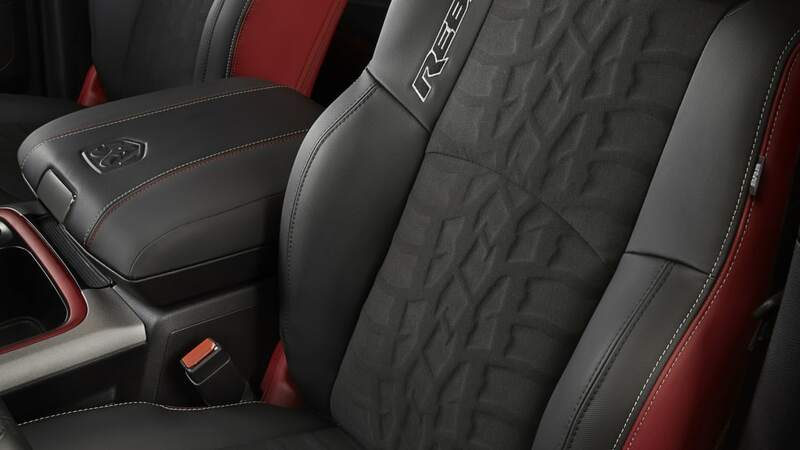 High-durability technical grain vinyl seats are finished in Radar Red and Black with Sedoso fabric inserts embossed with the Toyo tire tread pattern, matching the Rebel's actual footprint. 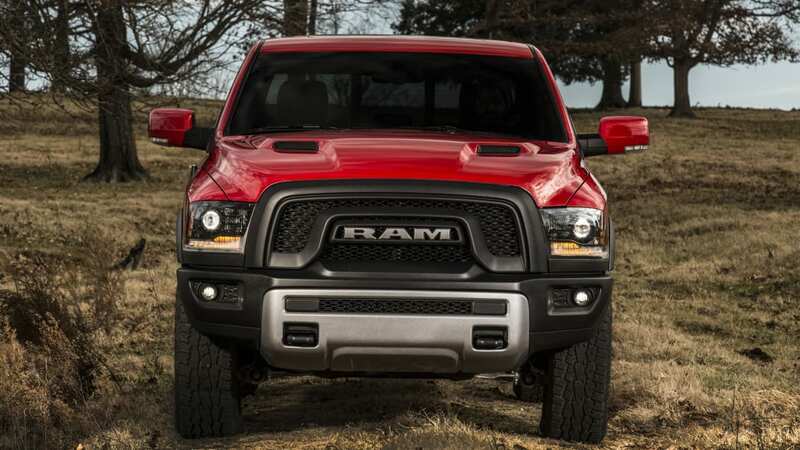 Standard heated front seats feature Light Diesel Gray accent stitching, Radar Red Ram's head embroidery on the headrests and Black with Light Diesel Gray Rebel nameplate embroidered on upper seat bolsters. 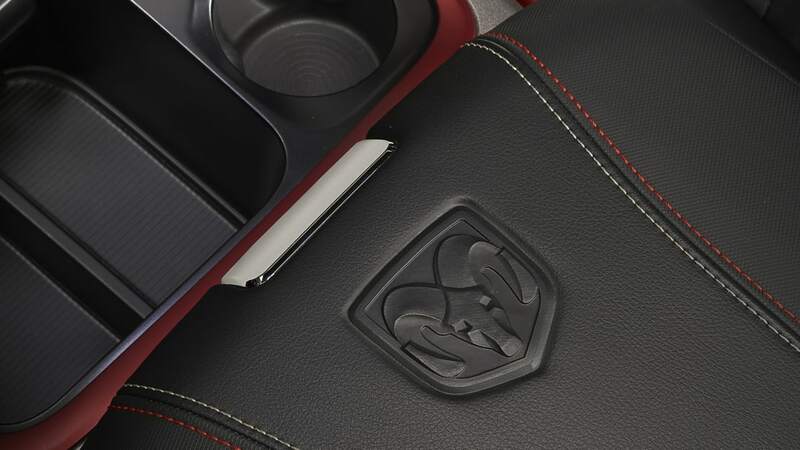 The all-black instrument panel, door armrests and logo-embossed center console armrest cover are topped with two-tone Radar Red and Light Gray accent stitching. The center stack and console are finished in Iron Gray Metallic paint giving a cast-iron appearance. An all-new center console bin incorporates a cellular phone/tablet holder with molded insert allowing for various-sized devices. 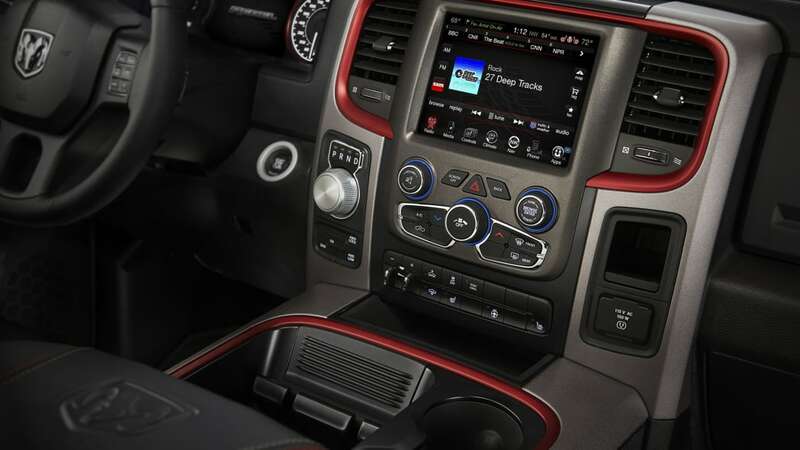 Radar Red anodized vent rings, door accent rings, door trim spears and center console trim ring add color detail to the interior. 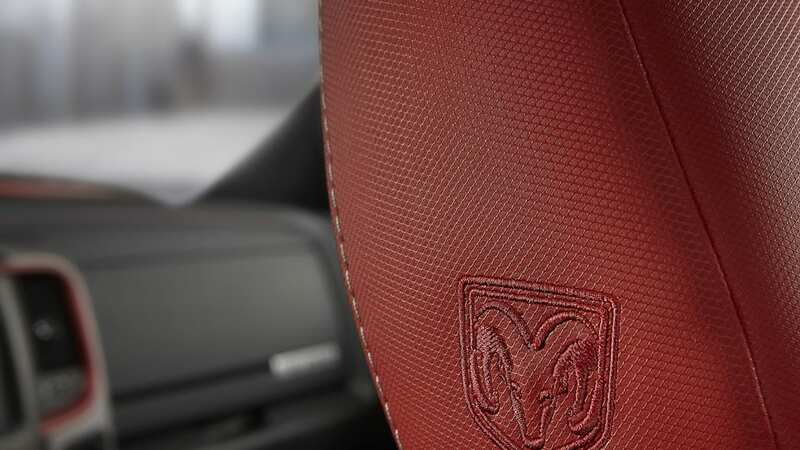 The Rebel's heated steering wheel is wrapped with semi-perforated black leather, accented with Radar Red X-stitches. 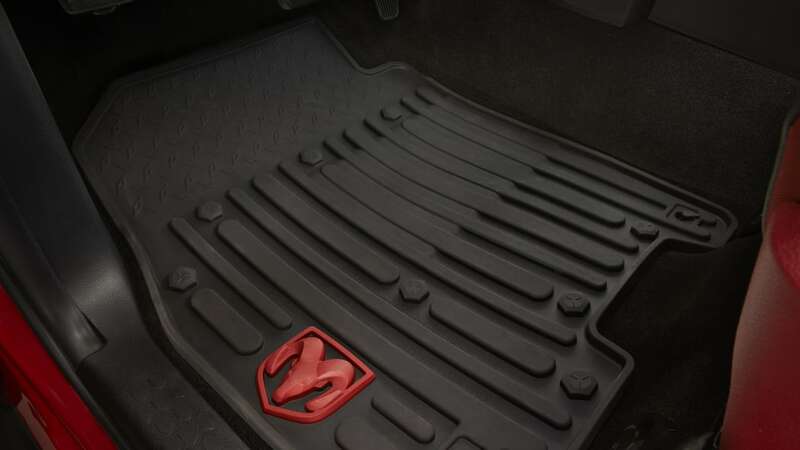 Deep all-weather rubber floor mats with contrasting Radar Red Ram's head help contain dirt, snow and debris. 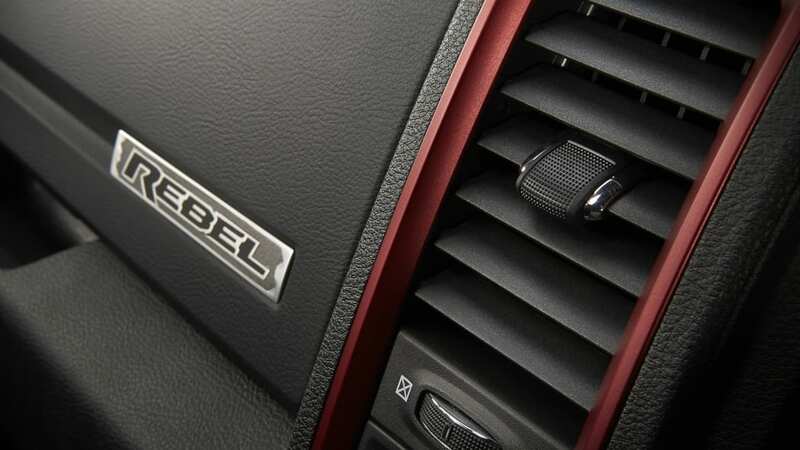 The Rebel's trail-running capability gets a boost with 1.0-inch raised ride height for improved off-road approach, departure and breakover angles. 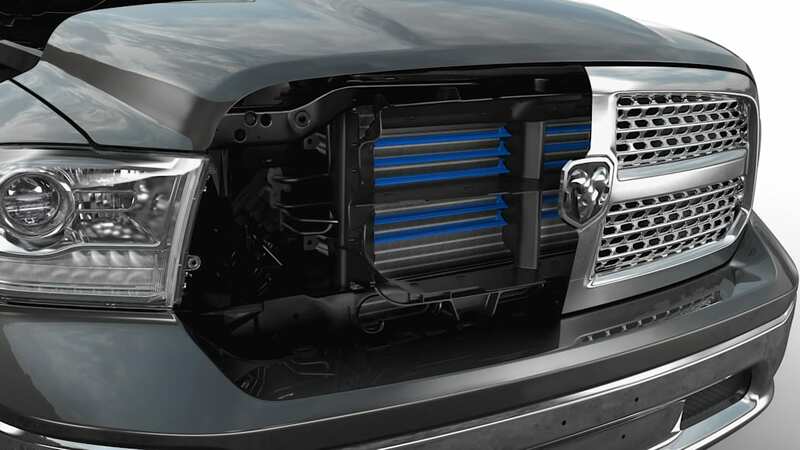 Bilstein supplies front and rear shocks with unique tuning and a new steering calibration is matched to the Rebel's increased ride height. 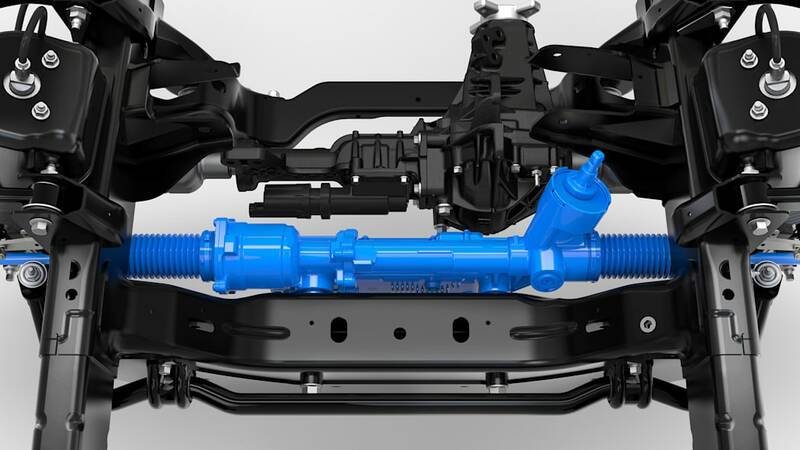 A softer rear stabilizer bar provides improved dynamics. 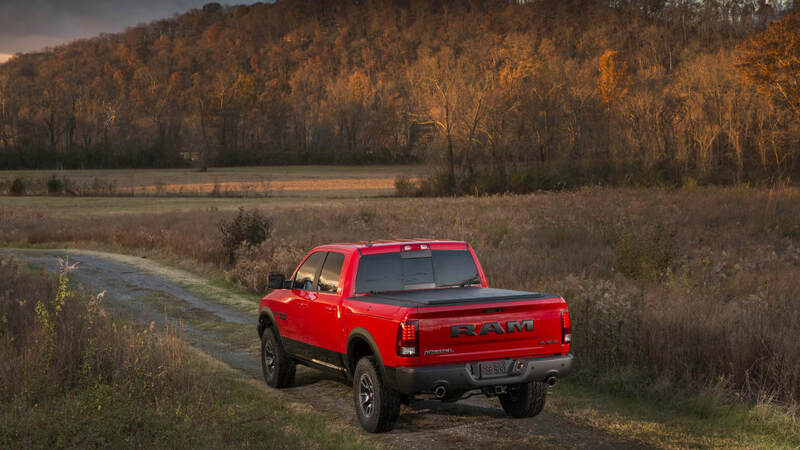 The Rebel takes advantage of Ram's exclusive air suspension system with a 1.0-inch factory suspension lift, which not only helps to clear the 33-inch tires but also contributes to additional ground clearance. 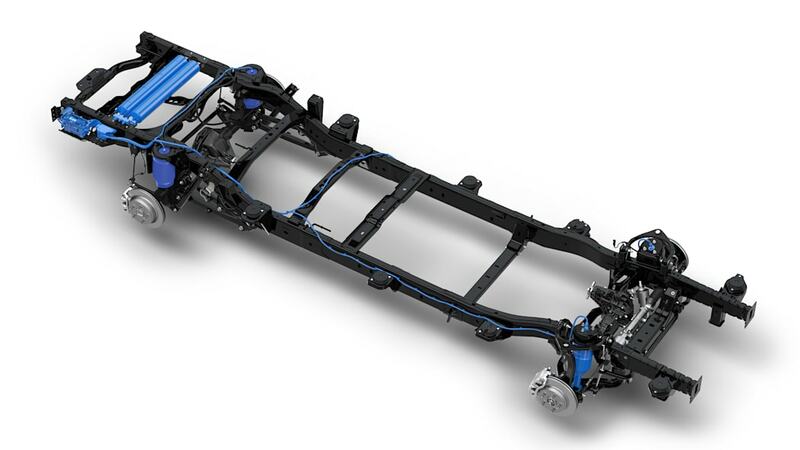 A modified alignment of the independent front suspension appropriately adjusts tire angle and aluminum lower A-arms absorb the load. 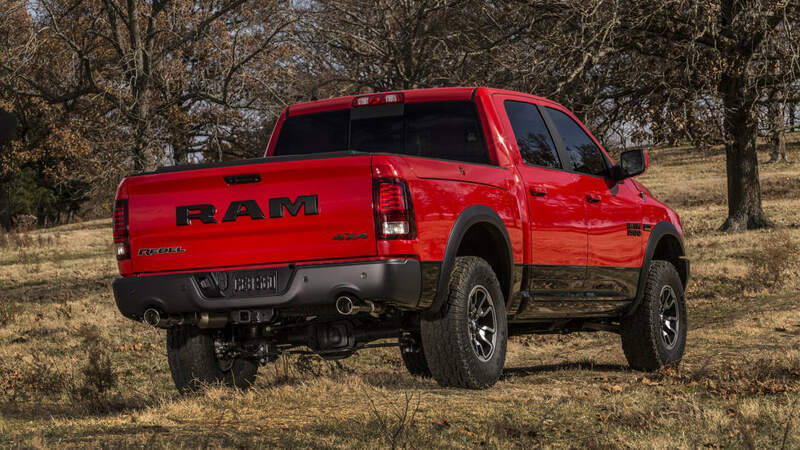 The combination of larger tires and a suspension lift yield best-in-class ground clearance of 10.3 inches, and a new stability program calibration takes Rebel's modifications into consideration. 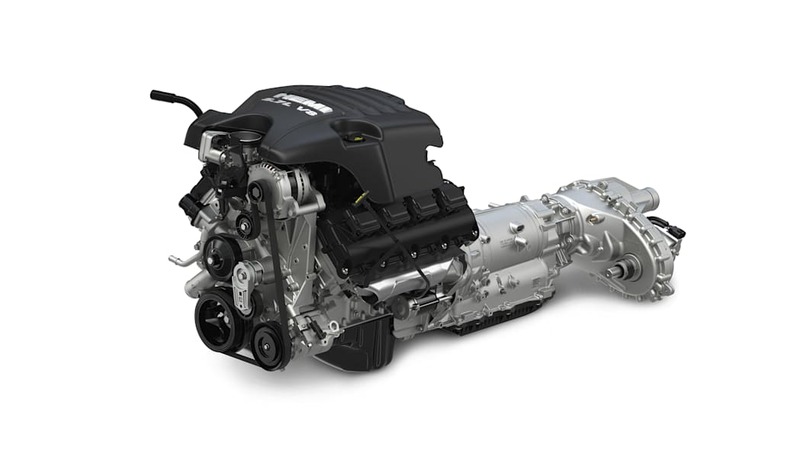 The 3.6-liter Pentastar V-6 engine (Ward's 10 Best Engines Award winner three years in a row) with variable-valve timing (VVT) offers 305 horsepower, 269 lb.-ft. of torque and best-in-class gasoline fuel economy of 25 miles per gallon (mpg). 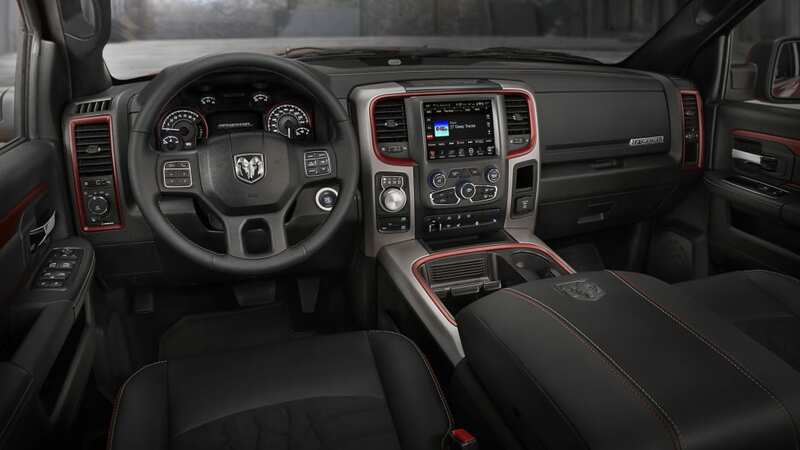 The class-exclusive eight-speed automatic transmission (TorqueFlite 8) – standard equipment with the Rebel's 3.6-liter V-6 Pentastar and 5.7-liter HEMI V-8 engines, which improves drivability and enhances fuel efficiency. 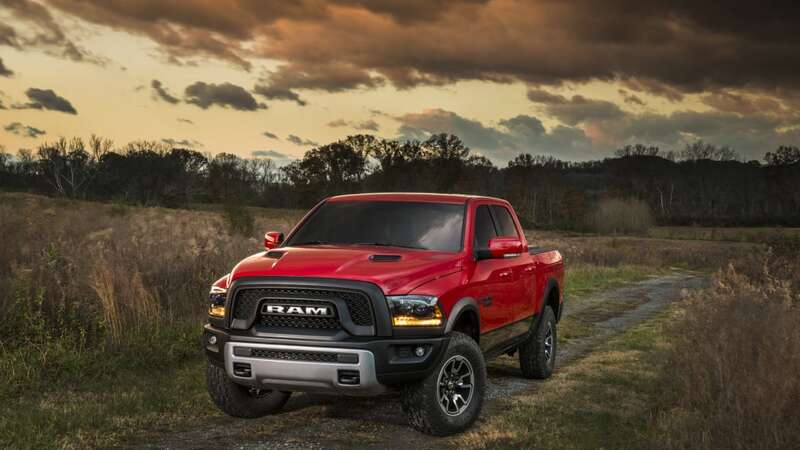 The 2015 Ram 1500's quality is scrutinized at the company's Chrysler Technology Center's state-of-the-art scientific labs in Auburn Hills, Michigan, including the Noise/Vibration/Harshness Lab, Electromagnetic Compatibility Facility, Wind Tunnel and the Road Test Simulator (RTS). 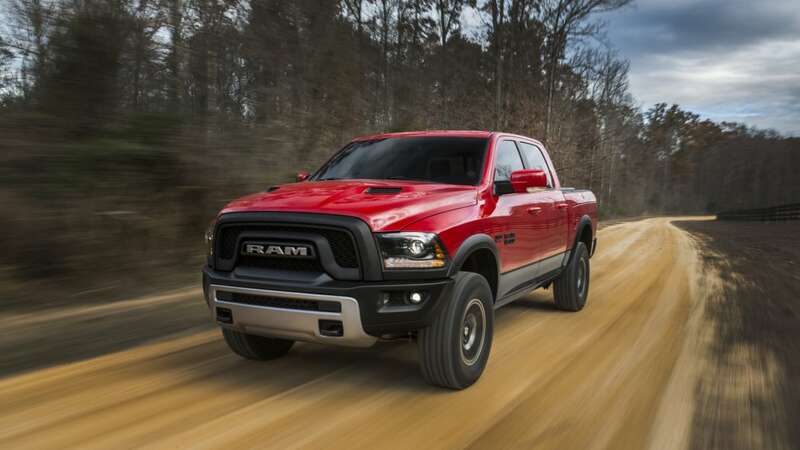 For example, the RTS recreates the abuse a truck endures at the hands of a 95th percentile driver – meaning someone who drives the vehicle in more severe conditions than 95 percent of all customers. 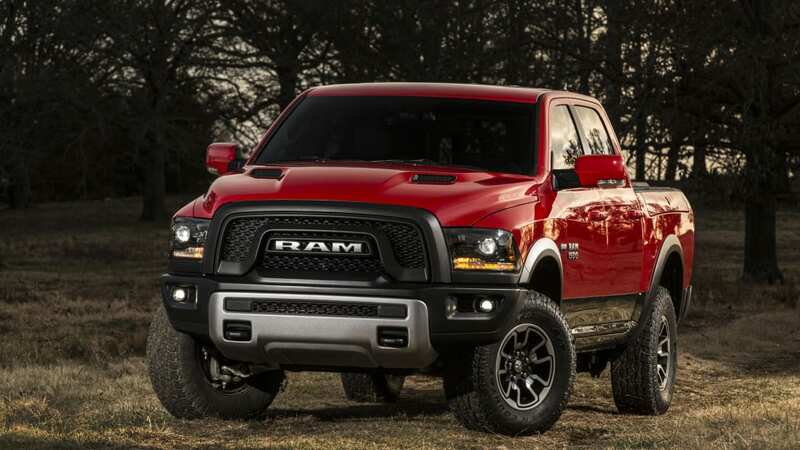 The RTS can put a lifetime of wear and tear on a truck in about one month's time. 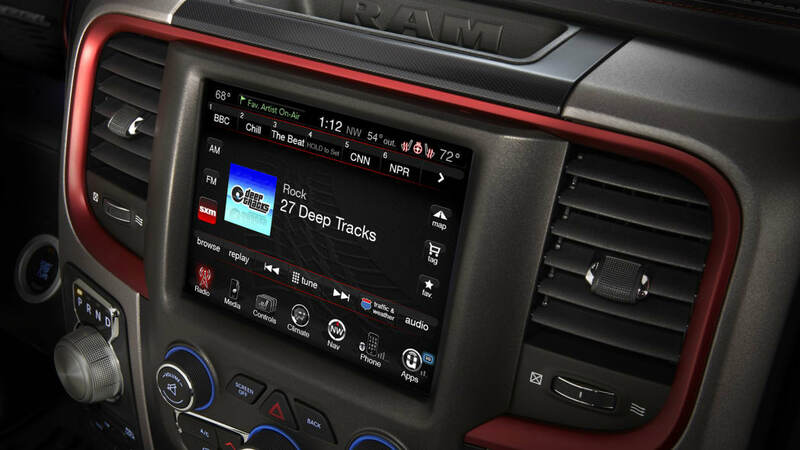 The Ram development team is committed to finding and fixing any issues before the customer does.